For the first time since a long five-game winning streak at the start of January, the Bruins have won back-to-back games. Since the 4-0 romping of Minnesota back on Jan. 10, the Bruins hadn’t won consecutive games. Winning back-to-back games after quite a while should be celebrated by the Bruins, but it was not the main event last night. It was all about appreciation and paying tribute to their stars. Not only their own players but also to other players making Boston such a successful sports city. Before the game against the New York Islanders, the Bruins welcomed the New England Patriots on the ice. The Patriots handled a very tough task to the Bruins. Now as they won their sixth NFL championship, it’s maybe the turn for the hockey club in Boston to make yet another push for Lord Stanley. The Bruins responding by making an important first step towards that goal –– beat the Islanders. The Isles are leading Metropolitan Division, surprising everybody in the NHL with the season they’ve endured. Defeating the best defensive team in the Eastern Conference, that was a tough mission. 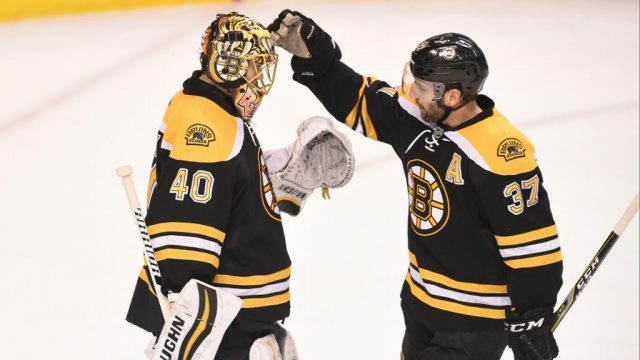 But the Bruins were able to accomplish that, thanks in large part to two of their franchise’s legendary players: Patrice Bergeron and Tuukka Rask. Firstly, the Patriots were given ovations for their success in the Super Bowl. Secondly, it was Patrice Bergeron receiving a standing ovation from a TD Garden crowd. At last, it was Tuukka Rask receiving a round of applause from the Bruins faithful. This all happened during the first period, which ended up scoreless. Later on, the fans at the Garden could have witnessed it live why they gave ovations to those guys (well, not counting the Patriots of course). Patrice Bergeron was playing in his 1,000th game. You probably already know that Patrice Bergeron deserves a standing ovation in every game he is playing. No. 37 is a tremendous leader on and off the ice, won the Stanley Cup with Boston in 2011, and has played his whole career with the Bruins. He will almost certainly wear that “C” on his jersey instead of an “A” when Zdeno Chara hangs up his skates. Just for the good measure, Bergeron scored in his 1000th game in the NHL. Was there ever any doubt that he is going to score in that game? Many people awaited a hat-trick, but a pair of goals was also sufficient. On the empty-net situation, when the Bruins tried to close out the game with a victory, David Pastrnak unselfishly left the puck for Bergeron to rock home one more goal before traveling to New York. Center is the most important part of any hockey line and Brad Marchand alongside David Pastrnak know it too. They knew that their recent success is also because of Bergeron and they were able to show their gratefulness in his 1000th game. Marchand made a huge effort to collect the puck from a goal, Pastrnak sacrificed his own empty-net goal for Bergeron. You can always construct a very good and well-oiled line in hockey based on three guys having solid chemistry and perfect relationship. It just applies accordingly to Marchand, Bergeron, and Pastrnak. Tuukka Rask was maybe left behind in everyone’s reviews articles after the game, which is understandable. But let’s not forget his performance either. Tuukka Rask won his 254th game with the Bruins, which just extends his most winningest goaltender status in the Bruins franchise history. Notwithstanding, he made 28 saves on 29 shots and was perfect once again. Rask now possesses 2.30 goals against average, which makes him tied for second-best (among qualifiers) in the NHL alongside Ben Bishop. The leader in that category is Robin Lehner with 2.02 GAA, who was opposing Rask on Tuesday at TD Garden. It will be a very tough and long road for the Bruins to land yet another championship parade to Boston. But they will undoubtedly try it to say at least. But you got to have such a gutsy feeling that if the Bruins were about to win the Stanley Cup, Tuukka Rask and Patrice Bergeron would be most likely some of the biggest heroes in that run.